Police in Madison, Alabama injured a 57-year-old Indian grandfather, leaving him temporarily paralyzed. 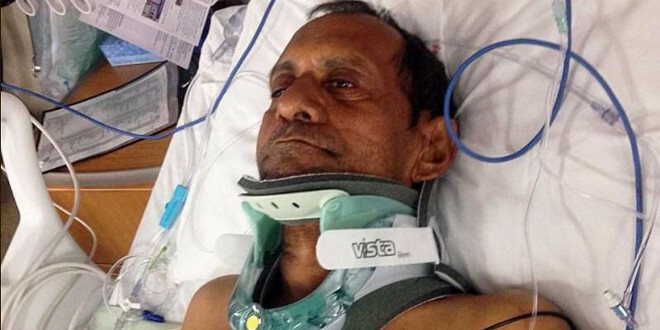 Sureshbhai Patel, a permanent resident of the U.S. was slammed to the ground by the police and hospitalized with a fused vertebrae. Patel arrived in the country a week before the incident to help his son and daughter-in-law with their 17-month-old-son. While Patel was taking a stroll around the neighborhood, he was stopped and questioned by two officers who claimed to be responding to a suspicious person call. The neighbor identified Patel as a “skinny black guy” whom he had never seen before. The caller said the Patel was acting suspiciously by looking into windows and going through the trash. As the officers were questioning Patel, he repeatedly said “no English,” “walking,” and “India” as he pointed to his son’s house by repeating the house number. The officers claimed Patel put his hands in his pockets, which escalated into slamming him to the ground. The incident left Patel with a bloody face, and in need of surgery to fuse two vertebrae. His son Chirag Patel, an engineer who described his town as affluent, found his father paralyzed at the hospital. Last summer, a similar incident took place when Chuamtoli Huq, a Bangladeshi-American woman was questioned and arrested by New York Police Department (NYPD) officers for waiting for her children and husband on the sidewalk outside a restaurant in Times Square, N.Y.
Huq, a human rights attorney, was dressed in South Asian attire when the officers approached her and began questioning. Huq was charged for blocking the sidewalk, resisting arrest, and disorderly conduct. In spite of leaving the sidewalk completely clear, the officers pushed her against the wall and handcuffed her. Huq later filed a lawsuit in federal court in September 2014, alleging that the NYPD officers used “unreasonable and wholly unprovoked force” when they arrested her without probable cause. As a young woman of color and as someone who has dealt with police brutality, I wanted to know how Huq felt about Patel’s encounter with the police. I was deeply saddened to hear about how Mr. Patel was brutalized by the Alabama police,” Huq said. “It is not uncommon for South Asian grandparents to stay with their families, especially to spend time with their grandchildren, and they usually walk in the neighborhood for exercise, as did my grandmother when she stayed with my mother. To imagine you can be brutalized for doing something so normal is shocking. That is what happened to me, except thankfully I wasn’t paralyzed. I was waiting on the sidewalk for my husband to bring back my kids from the restroom. You never imagine that this could happen. Incidents of police abuse have circulated in the media and it’s not a surprise Huq has witnessed over-policing of minority groups around the city and the country. “Over-policing of minority groups is a serious problem in NYC and nationally,” she said. “President Barack Obama has even convened a Taskforce on Policing and Department of Justice will be hosting community panels to hear from members on improving police-community relations. This is why you can see protests throughout the country to stop this brutality on communities of color. Black communities often are the most violent victims of policing, but other communities experience harassment as well, as I did, as a Muslim woman of color. Being humiliated and arrested in public can be shocking to anyone, and no one can agree more than Huq. Since over-policing and police brutality has become nationwide problems, especially in minority communities, Huq and South Asian organizations have come together to recommend methods to police departments so they can understand their communities better. We need strong policies to regulate police in how they deal with minority communities. There are local solutions in terms of increased oversight over local police departments. We need to develop training [sessions] with community based organizations on interacting with communities of color, around race, gender, religion and language. The recent killing of unarmed citizens has put a spotlight on the increased militarization of local police and the over-policing of minorities. The most popular tactic used to police minorities is the Stop-and-Frisk policy in New York City, sometimes called the Terry Stop in other parts of the country. This particular policy gives officers the authority to stop an individual and frisk them for weapons or other suspicious articles. The policy has mostly targeted young black and Latino men. In 2011, the New York Attorney General’s Office, found that “there were more stops of young black men in the city than there were actual young black men.” Such tactics have led to a vast racial disparity in the prison system. According to the Sentencing Project, more than 60 percent of the people in prison are racial minorities. The racial disparity in the prison system and in everyday policing has a huge impact on minority communities and how they are perceived by the larger society. As people of color, it is important to join forces and understand that racism impacts many levels of society. Unlike Patel, Michael Brown and Eric Garner did not receive an immediate response from the local police department or the FBI. This by no means is diminishing Patel’s pain or what his family is going through, but it is important to know that Patel’s situation received an immediate response from the Madison City Police Department and gave rise to a civil rights investigation by the FBI. Eric Parker, one of the officers involved in the incident, was fired and charged with third-degree assault. The FBI is conducting an investigation to see if any federal laws were violated. If you believe Patel was wrongfully convicted, support his GoFundMe campaign and help his family pay medical bills. To date, the Patel family has raised more than $185,000, surpassing their goal of $100,000. I read the words, “Grandfather visiting Alabama from India stopped by police while taking walk, left partly paralyzed” on my Facebook newsfeed while I was getting ready on an otherwise normal Wednesday morning. After reading the title again, this time more closely, I noticed the words “grandfather” and “India” written in the same headline, so I clicked and what followed was a feeling of pain. A 57-year-old Indian man was innocently strolling an affluent suburban neighborhood in Alabama, when he was allegedly stopped, frisked, and pinned to the ground for no reason. As a young girl who grew up in suburban New Jersey, the town of Madison does not sound so different from my home. All four of my grandparents lived with my family at different points in my childhood. Sureshbhai Patel’s story feels so close to home because I immediately think of my late grandfather, who would take me along during his mid-afternoon strolls. Hanging out with my grandparents, who would regularly take my brother and I to the playground, was a peaceful time. In fact, going for walks was a neighborhood tradition. There were quite a few “Indian grandparents” living with their families in our neighborhood. The thought that my grandparents would not be safe, doing something so harmless, because of something as superficial as racism horrifies me. The Patels’ story is the reality of many South Asian immigrant families living in the United States. A hardworking son, like Chirag Patel, immigrates from a small farming town in India and works his way through college to become an engineer. After years of hard work and sacrifice, him and his wife settle down and start a family in the suburbs, finally living their “American dream.” Once he’s comfortable in his new country of residence, he invites his father on a one-way ticket to permanently live with them, hoping to mutually benefit from his stay. Sureshbhai could have been anyone’s grandpa and Chirag could be anyone’s son. Today, it’s unfortunate to say, but as a brown woman walking through the gate at an airport, I expect to get searched. Anybody working in the line of defense is considered a civil servant, same as doctors, social workers, and nurses. So, with that in mind, aren’t police supposed to help people in danger and not create a terrorizing environment for people of color? If cops are the ones letting their own personal stereotypes of certain cultures and races get in the way of doing their job of protecting society, then maybe they should not be employed by the police force. This is bigger than police brutality. This has to do with a lot of deep-rooted racism because let’s not forget the brunt of the story: the neighbor who called the cops said the grandfather looked like a “skinny black guy,” which hence made him suspicious. That concept baffles my mind! Here we are, trying to bring justice to Micheal Brown’s and Travyon Martin’s lives with trending hashtags like #BlackLivesMatter and holding vigils and peaceful marches, but then we take 10 steps backward by immediately jumping to conclusions and blindly resorting to the fact that a “skinny black guy” is up to no good in the neighborhood. How many more paralyzed grandfathers and dead black men will it take for us to separate race and color with individual actions?! Previous articleIs Craig Hicks, the Suspect in the Chapel Hill Shooting, a Terrorist?